L'Oreal Elnett Satin Heat Protect Styling Spray | £7.49 // I ran out of the heat protectant I was using so I decided to give this one from L'Oreal a go as it is specially made for curls. Although I can't really comment on how it's protecting my hair, only time will tell, but the spray is even, has a lock for travel and it doesn't leave my hair feel sticky. It seems to be going down quite quickly though despite only using it for about a month. Aveda Smooth Infusion Style-Prep Smoother | £21 // I've been using this on towel dry hair before blow drying my hair. It helps to protect the hair as well as helping against humidity. I also find my hair feels a lot smoother and frizz free when I use this compared to when I don't. This has also made me want to try other hair products from Aveda and I may or may not have already placed an order for a couple more products. 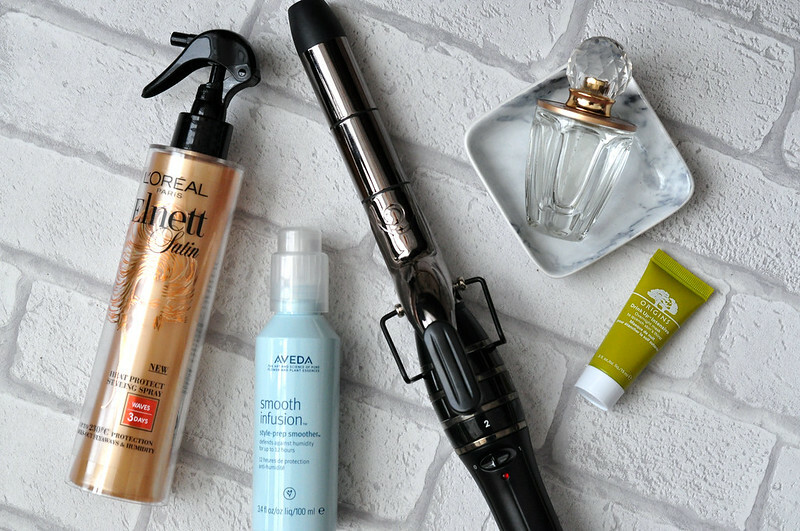 Enrapture Totum Styler | £59.99 // I probably bought this curler about a year ago but have only really been using it on a regular basis the past couple of months. I saved up my points and bought it when it was offer in Boots so it was slightly cheaper. I haven't really tested out the different styles by changing the temperature of the wand. Instead I've kept it on setting two for all three parts which gives a uniform tight curl that I let drop out a bit and creates a looser curl. I can curl my hair in about twenty minutes and it's the style I've been doing recently instead of leaving my hair to dry naturally. Taylor Swift Made Of Starlight Perfume | £12.99 for 30ml or £44.99 for 100ml // This was a limited edition of the original Taylor perfume which I can only find from The Perfume Shop. To me it smells completely different to the original but I still really like it. This one has notes of osmanthus flower, honeysuckle, orange blossom, apricot, passion fruit, mandarin, musk, peach, and woods. It's still fruity, floral and light but with a hint of musk which makes a bit more of an Autumnal scent This mini bottle is a good size to throw into my bag but also as I like to switch up my perfume quite a lot it means I don't have a lot of large bottles sitting around. Origins Drink Up Intensive Overnight Mask | £23 // I got a mini tube of this overnight mask with an Origins order and I'm glad I finally got a chance to try it. Although it is essentially a moisturiser, I've still really been liking using this and it's made a massive difference to the dryness of my skin. Plus it smells like apricots! I'll be buying a full size tube at some point.